Anadolu Efes Istanbul is on the verge of securing a place in the Turkish Airlines Euroleague Playoffs after a thrilling 89-86 overtime win over Brose Baskets Bamberg at Abdi Ipekci Sport Hall on Thursday. With the win Efes improved to 9-2 and second place in the Group E standings. Efes now needs one more win or one Unicaja Malaga loss – which could happen as soon as Friday – to advance. Meanwhile Bamberg remains winless in the Top 16. 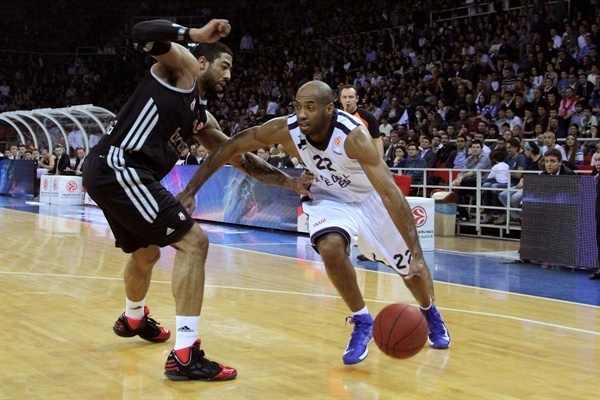 Efes went up by 13 points in the second quarter, but the visitors erased the deficit by halftime and the lead changed hands several times in the second half. At the end of regulation, at 76-76, Bamberg had a chance to win it, but Casey Jacobsen missed a potential game-winning layup. Efes took control in the extra session with a triple from Dusko Savanovic and a jumper from Jordan Farmar that put the hosts up for good. Farmar led in victory with 29 points plus 7 rebounds. Savanovic finished with 14 points, while Jamon Lucas dished out 11 assists along with 8 points. Bostjan Nachbar netted 24 for Bamberg, Maik Zirbes had 14, while Karsten Tadda, Jeremiah Massey and Jacobsen each scored 12 in defeat. Bamberg opened the game with Jeremiah Massey and Zirbes scoring inside on back-to-back possessions, but Josh Shipp nailed a triple that sparked a run from Efes. Farmar drove coast-to-coast for a layup, before baskets from Jamon Lucas and Dusko Savanovic, plus a dunk from Semih Erden, made it 11-4. With both teams playing uptempo basketball, Bamberg quickly answered with a dunk from Zirbes and a triple from Casey Jacobsen. Fastbreak layups from Farmar and Erden sparked another run of 8 unanswered points for an Efes 19-9 lead. A put-back from an inspired Stanko Barac made it a 12-point margin before Karsten Tadda nailed a triple at the buzzer to make it 23-14 at the end of the first quarter. Bostjan Nachbar hit a long jumper for the visitors to start the second quarter, but Efes maintained a high level on defense, while Sinan Guler and Kerem Gonlum scored layups at the other end for 29-16. After a timeout, Nachbar, Jacobsen and Zirbes all scored inside for Bamberg, and Tadda sank another three-pointer to get within 31-25. Savanovic stopped the bleeding with an easy layup, and Farmar hit a tough turnaround baseline jumper, but Anton Gavel hit back-to-back triples, cutting it to 35-33. Bamberg tied things at 37-37 after Zirbes scored twice more, but in the last minute of the quarter Efes first got a layup from Farmar, then a fastbreak triple from Shipp, before Farmar made a tough buzzer-beater, giving the hosts a 44-37 halftime lead. Massey opened the third quarter with a pair of free throws and a fastbreak layup, but Lucas made a couple of shots, including a tough one off the glass, to keep the hosts in front 48-41. Bamberg, however, replied with Tadda scoring a basket-plus-foul and a three-pointer before Jacobsen made a pair of foul shots to put Bamberg up 48-50. Farmar snapped the run with a tough runner, but Nachbar sank a long jump shot and Zirbes scored inside for 50-54. As things intensified on the floor, with players fighting hard for every ball, Farmar answered from downtown, before Barac and Gonlum helped Efes regain the lead and enter the fourth quarter up 59-58. A fastbreak layup from Kerem Tunceri started things in the fourth quarter. Guler sank a triple and Lucas scored on another fastbreak, giving Efes some breathing room, 66-60. The visitors were not going away; a dunk from Sharrod Ford, a reverse layup from Jacobsen and a pull-up jumper from Nachbar tied it at 66-66. Farmar answered with an off-the-dribble triple, but Jacobsen made a layup-plus-foul and Nachbar sank a triple of his own for 71-72. After a timeout, Savanovic hit a triple from the right corner, but Zirbes tied the score from close range. After Farmar’s driving layup, Nachbar made a tip-in for 76-76, and that turned out to be the last basket in the regulation as Jacobsen missed a potential game-winning layup with 2 seconds to go. In the extra session, Gavel’s fastbreak layup put the visitors in front first, but Savanovic scored from downtown and Farmar nailed a jumper to make it 82-78. After Nachbar scored a pair of free throws, Erden made a difficult hook shot to protect Efes’s lead. Bamberg’s hopes remained alive after Nachbar sank a triple on the ensuing possession, but Farmar answered right back with a tough three-pointer from the right corner for 87-83. Savanovic put the game away with a pair of free throws with 9 seconds to go, before Nachbar rounded out the scoring with a triple at the buzzer.